June 2nd to June 5th is a pretty big weekend for convention-goers as two shows will be happening simultaneously on opposite sides of the country: Phoenix Comicon and Awesome Con. Fans can visit the Phoenix Convention Center in booth #760 for a complete journey through Valiant’s critically acclaimed universe with a complete selection of Valiant trade paperbacks and deluxe hardcovers for award-winning titles. Additionally, fans can get their hands on 4001 A.D. #1 Phoenix Comicon Exclusive Variant by Jeff Piña. Fans can also hit Washington, D.C.’s Washington Convention Center in booth #508 for the weekend’s second helping of Valiant and its trend-setting titles with another complete selection of Valiant trade paperbacks, deluxe hardcovers, can’t-miss merchandise. Get the inside scoop on the most celebrated superheroes in comics for VALIANT 101: NEW FANS START HERE—hitting Phoenix Comicon on June 4th in room North 121 C at 1:30 PM MST and Awesome Con on June 4th in room 154 at 1:15 PM EST. From X-O Manowar to Ninjak to The Death-Defying Dr. Mirage and Archer & Armstrong, jump on board here with a concise and fun-filled introduction to Valiant's biggest, most memorable characters…and find out for yourself why Buzzfeed calls Valiant "a universe full of your new favorite superheroes." Then, Valiant’s biggest weekend meets its most titanic event yet with Valiant: The Summer of 4001 A.D.—coming to Phoenix Comicon on June 5th in room North 121 C at 12:00 PM MST and Awesome Con on June 5th in room 145 B at 12:15 PM EST. 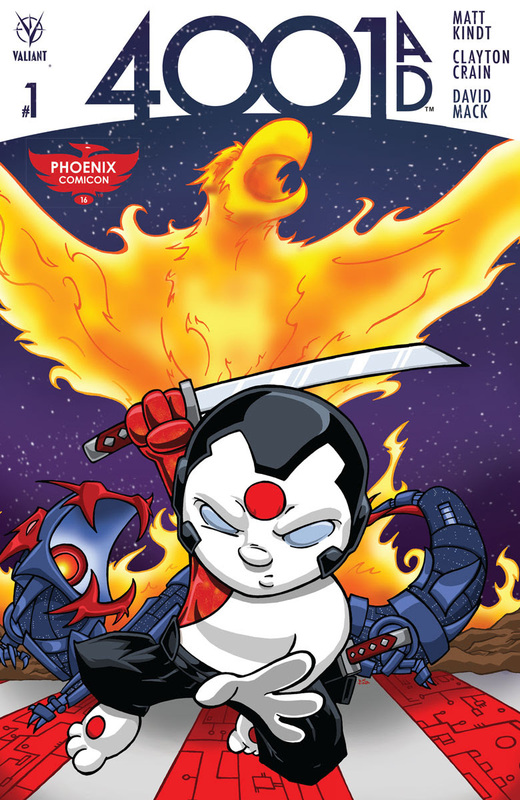 This weekend, the Valiant 2016 Convention Tour is doubling down for Phoenix Comicon 2016 and Awesome Con – and we’re bringing a can’t miss cavalcade of exclusives, merchandise, programming, panels, and the best-reviewed comics in the industry to both shows! From June 2nd to June 5th, visit the Phoenix Convention Center in booth #760 for a complete journey through Valiant’s critically acclaimed universe with a complete selection of Valiant trade paperbacks and deluxe hardcovers for award-winning titles, including X-O MANOWAR, DIVINITY, RAI, HARBINGER, ARCHER & ARMSTRONG, NINJAK, and many more! And don’t miss the bundles of Valiant merchandise unloading into Phoenix, including the 4001 A.D. #1 (of 4) PHOENIX COMICON EXCLUSIVE VARIANT – featuring the artwork of fan-favorite artist Jeff Piña (Zombies vs. Cheerleaders)! New York Times best-selling writer Matt Kindt (DIVINITY II), blockbuster artist Clayton Crain (RAI, Carnage), and superstar artist David Mack (Daredevil) kick off the FIRST issue of Valiant’s most ambitious summer event here as Rai leads the heroes of the 41st century into an explosive rebellion against the despotic ruler Father and the forces of New Japan! And stick around to meet some of the hottest creators in comics throughout the weekend with a slate of special guests including Valiant-exclusive superstar David Baron (DIVINITY II, BLOODSHOT REBORN), and Jeff Piña! Then, from June 3rd to June 5th, hit Washington, D.C.’s Washington Convention Center in booth #508 for the weekend’s second helping of Valiant and its trend-setting titles with another complete selection of Valiant trade paperbacks, deluxe hardcovers, can’t-miss merchandise, and more! And meet the minds behind the upcoming FUTURE OF VALIANT throughout the weekend with special guests including superstar writer Fred Van Lente (GENERATION ZERO), and red-hot writer Rafer Roberts (HARBINGER RENEGADES, A&A: THE ADVENTURES OF ARCHER & ARMSTRONG). Plus: Get the inside scoop on the most celebrated superheroes in comics for VALIANT 101: NEW FANS START HERE—hitting Phoenix Comicon on June 4th in room North 121 C at 1:30 p.m. MST and Awesome Con on June 4th in room 154 at 1:15 p.m. EST! You've heard the buzz… You've seen the reviews… Now find out where to start with Valiant Comics! From X-O MANOWAR to NINJAK to THE DEATH-DEFYING DR. MIRAGE and ARCHER & ARMSTRONG, jump on board here with a concise and fun-filled introduction to Valiant's biggest, most memorable characters…and find out for yourself why Buzzfeed calls Valiant "a universe full of your new favorite superheroes"! Then, Valiant’s biggest weekend meets its most titanic event yet with Valiant: The Summer of 4001 A.D.—coming to Phoenix Comicon on June 5th in room North 121 C at 12:00 pm MST and Awesome Con on June 5th in room 145 B at 12:15 pm EST! This summer…the future of Earth will be decided in the stars when Valiant presents the blockbuster crossover event of the year in 4001 A.D.! Now, get primed for the epic showdown between Rai and the forces of New Japan right here! Plus: Don't miss an all-new round of news and announcements for ARCHER & ARMSTRONG, BLOODSHOT REBORN, DIVINITY, FAITH, NINJAK, X-O MANOWAR, and more! No matter what city you visit, we’ll see you there! And don’t miss a moment of the action as Valiant’s one-of-a-kind convention road show marches on through Phoenix; Washington, D.C.; Denver; and more all summer long! Look for more dates to be added to the Valiant 2016 Convention Tour all year long!